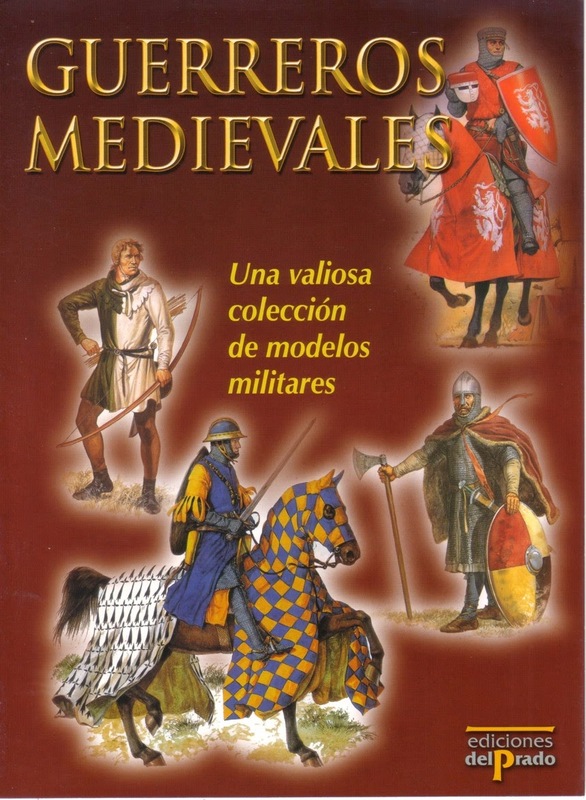 Advertisement for the 60mm Medieval Collection. The Spanish publisher del Prado was established in 1988 and is known for its partwork series subscriptions that come bundled with collectible models. They are supposed to have had a presence in the USA at one time, but I have never seen any of their publications on sale anywhere. I'm not even sure if they are still in business, since some of their properties have apparently been sold off. I was more familiar with their diecast fire engines, since they made them in 1/72 scale, but recently I found out that 1/72 Napoleonic and medieval figures were sold under the del Prado label. I was a bit hesitant about buying any of the figures at first, since it seemed that some of the putative 1/72 Napoleonic figures might actually be closer to 28mm, but after finding a large lot of the medieval figures on eBay for a little over US$1 a figure, I decided to take a chance and purchase the lot. When I received the package, I wondered what I had been sent because it looked as if the contents had been taped up in a tattered paper bag that was full of holes. When I opened the paper, I saw that half of the figures inside had fallen out of their blisters. The plastic packaging contained water, and the backings were still all damp. It seems Deutsche Post somehow half drowned the package, and that the outer wrapping was originally a box, before being deformed by water damage. Anyway, the figures all seemed to be there, and the loose figures didn't seem to have much in the way of damage to the paint, so I guess it wasn't a huge deal in the end. Here are the figures I received, starting with castle besiegers in red and white livery. Next are the castle defenders in gold and red livery. Overall, I like these figures. They match up well with 1/72 plastics, and are well sculpted with good proportions. Some of the figures seem to be made of lead, so the metal is very soft, but others are made of a harder tin alloy. The paint jobs are not the greatest quality. It is a bit on the sloppy side, but at least they are painted (unlike the large part of my collection). I may try to buy some Napoleonics to do comparisons at some point if I see them for cheap, but I really would like to complete a set of medieval figures. It is unclear how many figures were produced in the series, and from the looks of some of the poses, a siege engine may even be part of the line. I'd be interested to hear from people who have more information on these figures. This post is a follow-up from my previous article on McEwan Miniatures, and covers several of the human and dwarf figure sets. The first picture has figures from the Men at Arms set (left), and the Warrior Maid set (right). The Men at Arms set comes with 6 pairs of identical swords and shields. The Warrior Maid set comes with a mounted version of the figure (which seems to have been missing in my set), and a horse, along with shields and swords. A male footman in ring mail is also included in the set. The men-at-arms are sculpted in a simple style, with high crowned helmets that make them appear to be taller than they actually are. The figures in the Warrior Maid set are more detailed, but the sculpting is on the chunky side. The next image is of the Dancing Girls set (left) which were originally a Dancing Girl (HE-9) and Harem Girl (HE-3), and the Evil Priestesses set (right) which were originally a Priestess of Isis (WZ-4) and Sorceress (WZ-2). The dancing girls are simple sculpts, and probably the sculpts that I like the best out of all the figures in this particular review. The priestesses have a lot more detail, but again the details are large and chunky, which detracts from the figures. In the next image is the Fat Knight Sir Boars (left) formerly known as just Fat Knight (HE-18). The set comes with a mounted version of Sir Boars and a horse in caparison, as well as heater shields and swords for both mounted and dismounted figures. The second pair of figures (right) are the hag (formerly WZ-3) and hunchback (formerly WZ-5) from the Hunchback Servant & Hag set. Sir Hubert de Boars is short and fat. The sculpt is nice and simple. The same goes for the hag and the hunchback. I like the later in particular, which seems to be modeled after Igor from Young Frankenstein. In the final picture, the first two figures (originally HE-26 and HE-10) are from the Dwarf & Dwarfett set (left), while the three figures to the right are from the Armored Dwarfs set. Both sets come with a mix of weapons (mostly axes) and round shields. For me, these dwarves are on the tall side. I suppose they could be used as mountain dwarves. There are three poses for the armored dwarves, but you get a random mix in the set. The first armored dwarf seems to be a modified version of the male dwarf from the Dwarf and Dwarfett set. Overall, I'd say that the humans can pretty much be used as 1/72 scale figures, but they have the typical overly large hands and heads encountered with many metal figures. The dwarves on the other hand, are a lot taller than the typical miniatures I use for dwarves, so are not particularly useful for me.